We cannot always be thinking of God, nor is it necessary. We can be constantly united with God without the constant thought of Him. The union of our will with the will of God is the sole form of union that is really requisite. Wherein, then, lies the utility of the exercise of the presence of God enjoined by all the masters of the spiritual life? We will now explain. It is necessary to have an absolutely sure intention in all our actions, so that the generous fulfillment of our daily duties may be directed toward the highest supernatural ideal. Thus, our life, apart from moments of prayer, will be a prayerful life. It is clear that the habit of giving an upward glance to God at the moment of action is a great assistance in aiding us to behave always with a pure intention and in freeing us from our natural impulses and fancies, so, that, retaining our self-mastery, or rather, God becoming the sole Master, all our movements become dependent upon the Holy Spirit. We see in the Gospel that whenever our Lord was about to undertake some important step, He always paused for a moment to raise His eyes to Heaven, and only after this moment of recollection did He take up the work He had to do. “He lifted up His eyes to Heaven” is a phrase that recurs with significant frequency. And doubtless, when there was no outward sign of this prayer, there was the in­ward offering. The ideal is the same for us. The constant subjection of self to the guidance of the Holy Spirit is made easier from the fact of His presence in the soul, where He is asked explicitly to preside over all our doings. It is impossible to put the spirit of recollection into generous practice unless there is also a deeply rooted spirit of self-renunciation. We shall not submit wholeheartedly to the invisible Guest unless He is kept in close proximity to us. The death of self cannot take place unless the spirit of life is already installed, unless it moves upon the face of the waters. Man will not consent to drive away the money-changers from the temple of his soul until he realizes that it is a Holy of Holies — not a house of traffic, but in very truth the house of God. There cannot be entire dependence upon the Holy Spirit’s guidance, which is the true meaning of living in Christ, without complete self-renunciation. There cannot be complete self-renunciation without the constant underlying spirit of faith, without the habit of interior silence, a silence where God is dwelling. This article is from How to Pray Always, which is available from Sophia Institute Press. Many do not see the connection between thoughts about the King and the service of the King; between the interior silence, which seems to consist in immobility, and the continual detachment, which is the essence of supreme activity. If we look closer, it will be seen that there is a strong, close, unbreakable link between the two. Find a recollected person, and he will be detached; seek one who is detached, and he will be recollected. To have found the one is to have discovered the other. The truth of this may be estimated by the ease with which the one or the other of these two types can be found. Anyone who tries, on a given day, to practice either recollection or detachment cannot ignore the fact that he is doing a double stroke of work. If the soul, to become fully Christlike, ought to live in entire dependence upon the Holy Spirit, and if it is not pos­sible to live in complete dependence upon the Holy Spirit unless the whole life is recollected, it is evident that recol­lection, in the sense that has been explained, constitutes one of the most precious virtues that can be acquired. Not to try to live in interior silence is equivalent to giving up the effort to lead a truly Christian life. The Christian life is a life of faith, lived in the invisible for what is invisible. Anyone who is not in constant contact with the invisible world runs the risk of remaining always on the threshold of a true Christian life. We must give up living in the outer and more su­perficial enclosure of the soul; we should go within and penetrate into its deepest recesses. And when we have arrived at this point, we must still go fur­ther in, until we reach the center, which is no lon­ger self, but God. There is the Master. . . and there it is that it may be vouchsafed us to abide with Him for a whole day. Now, once we have been permitted to pass a day with Him, we shall desire to follow Him everywhere like His Apostles, His disciples, and His servants. Yea, Lord, when I have the privi­lege of spending the entire day with Thee, I shall wish to follow Thee always. The weak and unstable dislike to be alone. The majority of people look to amusement to save them from exerting themselves. They lose themselves in what is nought so that self may not be lost in what is all. It was in the midst of the silence of the night that almighty God came to earth. Silence [writes Father Faber] has ever been, as it were, the luxury of great holiness. . . . So it is the first life which He, the eternally silent spoken Word of the Father, chooses for Himself. All His afterlife was colored by it. In His childhood, He let speech seem to come slowly to Him, as if He were acquir­ing it like others, so that under this disguise He might prolong His silence, delaying thus even his colloquies with Mary. Mary also herself, and Jo­seph, caught from Him, as by a heavenly conta­gion, a beautiful taciturnity. In His eighteen years of hidden life, silence still prevailed in the holy house of Nazareth. Words, infrequent and brief, trembled in the air, like music which was too sweet for one strain to efface another, while the first still vibrated in the listening ear. In the three years’ ministry, which was given up to talking and teaching, He spoke as a silent man would speak, or like a God making revelations. Then, in His Passion, when He had to teach by His beautiful way of suffering, silence came back again, just as an old habit returns at death, and became once more a characteristic feature of His life. We think so much of appearances that we are unable to appreciate anything that does not appeal to the senses. Silence is the source whence springs effectual effort. The jet of water is forced silently to bore its way through the stone before it is able to burst forth bubbling into song. It must be well understood that when silence is recommended, it is interior silence that is meant, which should be imposed upon the senses and imagination to avoid the liability of being taken out of ourselves in spite of ourselves at every moment. If the oven door is perpetually kept open, to adopt the simile used by St. Teresa, the heat will escape. It takes a long while to raise the temperature, but a second is sufficient for it to run down. A crack in the wall will let in the icy outer air, and the whole process has to be begun again. An excellent method of preserving interior silence is to keep exterior silence. This is the reason for the cloister and the grill. But even in the world, each one of us can make his own solitude, a boundary beyond which nothing can force its way unperceived. It is not noise in itself that is the difficulty, but noise that is pointless; it is not every conversation, but useless conversations; not all kinds of occupation, but aimless occupations. In point of fact, everything that does not serve some good purpose is harmful. It is foolish, nay, more, it is a betrayal to devote to a useless objective powers that can be given to what is essential. There are two ways of separating ourselves from almighty God, quite different from one other but both di­sastrous, although for different reasons: mortal sin and voluntary distractions — mortal sin, which objectively breaks off our union with God, and voluntary distractions, which subjectively interrupt or hinder our union from be­ing as close as it ought to be. We should speak only when it is preferable not to keep silence. The Gospel does not say merely that we shall have to give an account of every evil word, but of every idle thought. We must speed up our lives, as modern people express it, and get rid of everything that lessens the output; the spiritual life, more than anything else, requires this speed­ing up, for it is the most important. The interest the majority of people take in things of no account — the noises in the street, the behavior of passersby, the flagrant empty-headedness of the daily pa­pers, whether intentional or unintentional — is almost incredible. What a joy it would be if suddenly, by some un­expected good fortune, everything in the world that does not serve some good purpose were to come to an end; if those who have nothing to say were to keep silence, this life would be a paradise! The cloister is what it is because there men and women learn how to keep silence. They do not always succeed, but at least they are learning, and that is a great thing. Elsewhere it is a lesson that is not even learned. Yet speech is a great art, and conversation a valuable pastime, perhaps the most precious in existence, but good use is not abuse. It is customary on the anniversary of the Armistice to keep a two minutes’ silence: this silence is in memory of the victory of the Allied troops. If the world would learn how to keep silence, this practice of recollection would lead to many victories. Our usual habit is to behave in an exactly contrary manner. Everyone talks; no one listens, least of all to Him who most deserves to be heard: the interior Master. There are few perfect souls because there are few lovers of si­lence. Silence is the equal of perfection, not in all, but in a great many instances. Put it to the test — it is worth the trouble — and the result will be a revelation. Editor’s note: This article is adapter from a chapter in Fr. 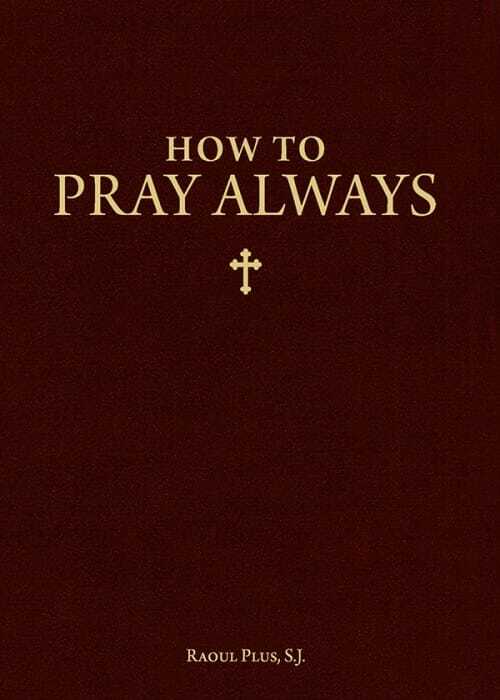 Plus’ How to Pray Always, which is available from Sophia Institute Press.